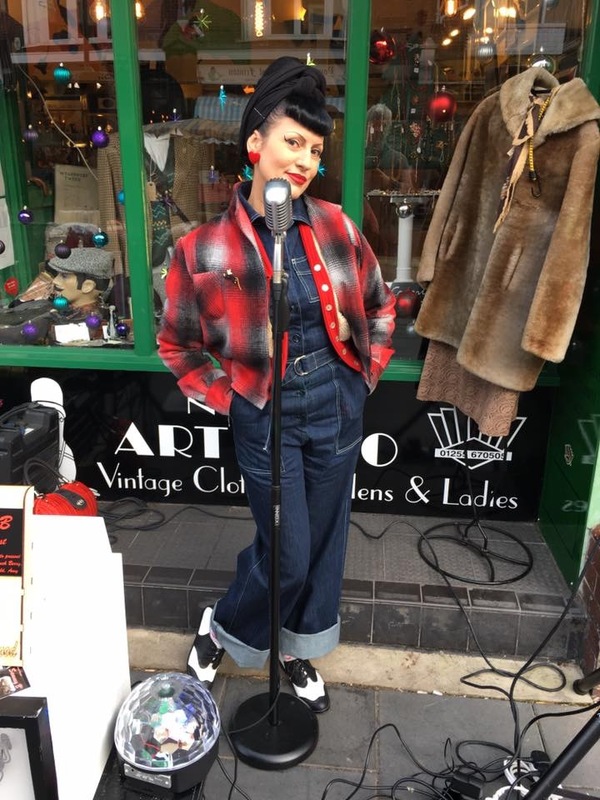 1950s styled female vocalist, singing songs from the 50s to present day. She also offers an Amy Winehouse tribute show. Looks like she has come straight out of the 1950's with her Bettie Page bangs and retro look. She sings songs not only from the 1950's but also, 60's, 70's and 80's up to present day! One of her niches is that a lot of the songs she sings were originally performed by male vocalists. For example: Elvis, Cliff Richard, Chuck Berry, Buddy Holly. She sings many songs by these artists and gets everyone up dancing! Sings a wide range of songs, songs you would not expect, a lot of 80s favourites for instance. Also offers an Amy Winehouse tribute show which consists of an hour of Amy Winehouse songs followed by 2 or 3 further sets of the usual mix of rock 'n roll, 80s, 90s, present day etc. Can cater to whatever theme you have in mind, be it 50s, 80s or Halloween for example. She sings a lot of songs from the Rocky Horror Picture Show Soundtrack which always go down well. Rate based on 3 set show (sets are 55 mins long each) Additional charges for venues outside 25 miles from base in Walton on the Naze, Essex. She was a last minute replacement after being let down by a band, but it was possibly the best thing that could have happened. All my family and friends were up singing and dancing and thoroughly enjoyed the performance. We enjoyed it so much that I then went on to use her as our star act at the charity vintage tea party in aid of Help Alexia walk the following month. This then drew all the crowds back and more and helped us raise lots of money for a very good cause. highly versatile in accommodating a crowd, and has now become known as a performer in the area and always draws a crowd to the venue. Bookings have ranged from private bookings, charity and event nights. We have also introduced Sunday lunchtime music sessions with her whilst customers dine in the restaurant, and we are looking to pursue this on a regular monthly basis due to the success of this so far. She is able to cater for specific needs if discussed in advance, which fits in well with our private function bookings. what an excellent little find! It's an absolute pleasure having her perform at The Blacksmiths Arms. She has performed here a few times now and we will definitely be looking to have her again in the near future. Wow! what a marvellous performance by you yesterday. I have received many good comments and the entire audience appeared to have gone back to their teenage ages because you certainly got their feet twitching. Thank you for coming along and I do hope it will be the first of many visits. we knew she would be just right for our joint 70th birthday party at the Three Rivers Golf and Country Club in Cold Norton, near Chelmsford. We had around 70 guests of all ages, and she (at our request) sang some really lively songs from different eras e.g 50's, 60's, 80's. It was impossible to sit still, we just had to get up and dance. A really great performance, our guests loved it, she really looks the part too! We would not hesitate to engage her again. Amy Winehouse Tribute Show available consisting of an hour of Amy Winehouse songs followed by 2 or 3 further sets of a mixture of 1950s to present day. For Amy Winehouse show: Dressed as Amy complete with tattoos. Experience: Pubs, clubs, private parties, festivals, outdoor events.